For some reason, my neighborhood grocery store decided to place their Easter candy aisle this year smack in the middle of….the produce section. Needless to say, somehow I came home with an assortment of gorgeous little fruity and chocolate eggs. 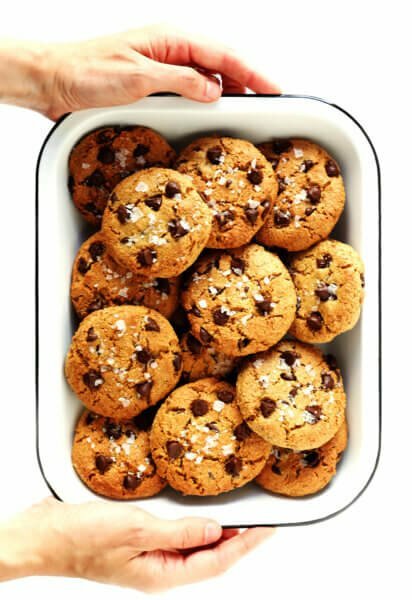 But rather than just sit in a candy bowl (where they’re certain to disappear instantly at our house), I decided to get a tiny bit crafty and whip up some of my favorite no-bake cookies to go with them. Commonly known as “haystacks” (in the fall) or “birds’ nests” (in the spring), these little cookies have been a favorite ever since I was a kid. With just four ingredients (or five if you count the chocolate), they’re guaranteed to be super easy, super sweet, and SUPER delicious! They’re a great project as well for kids, since they don’t need to go in the oven, and they’re fun to mix up. 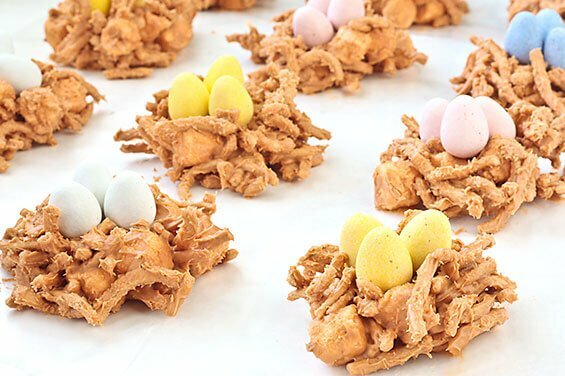 You will love this Butterscotch Birds’ Nests (or “Haystacks”) Recipe! Such a creative and sweet treat to celebrate Easter with little ones! Line a cookie sheet (or two) with waxed paper. Then stir in the peanut butter, and mix until it is melted and the mixture is smooth. Add the chow mein noodles and marshmallows and continue stirring until everything is evenly coated. Drop by spoonfuls onto the waxed paper. Let cool until they are hardened. 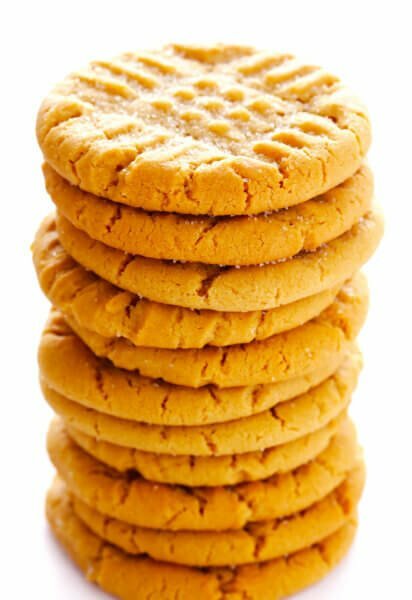 Feel free to add in any nuts and/or coconut to these cookies too. They also taste great made with melted white chocolate or semi-sweet chocolate chips as well! 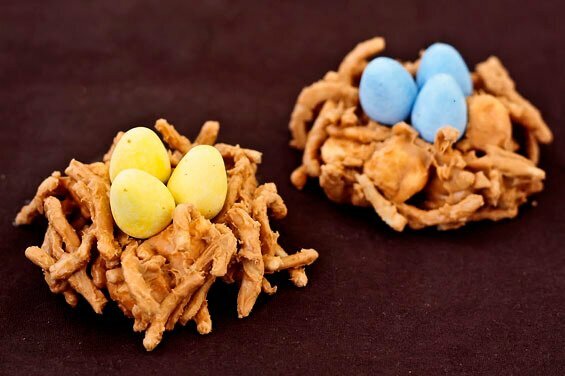 these birds nests are so adorable. what a great idea for easter! Oh my goodness, how cute! 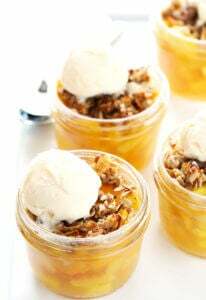 This reminds me of a sweet my mom makes with corn flakes, peanut butter and butterscotch chips. Yum! So cute… My mom used to make these all the time when I was a kid. They take me back! I made nests too, but yours sound way more delicious! Soo coooool! I love. Though not so sure where to get butterscotch chips in Ireland.. Not the biggest commodity. I think I need to move outta the shticks.. These are ADORABLE!! I usually just make them with nuts, butterscotch chips, and chow mein noodles, but these are way better! Love the addition of the marshmallows. And the little candy eggs! Genius! Brought some to work and will bring the rest to Easter dinner! Thanks! Hi. Ingredient list says butterscotch chips. Instructions call melting chocolate chips. Thanks.